A subtly fragrant aromatic wine with tobacco leaf, spice and pepper notes. Enchanting black fruit nose. This medium bright ruby red wine has a subtly fragrant aromatic wine with tobacco leaf, spice, and pepper notes. Enchanting black fruit nose. 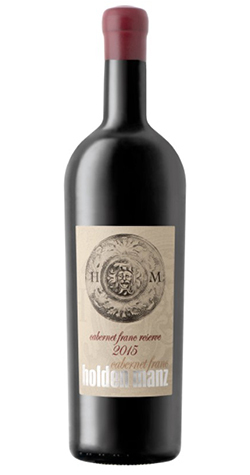 Rich and elegant soft-textured wine with predominant cassis and dark berries. Well balanced savoury flavours with good volume. Wood is well integrated, pleasantly subtle tannins. Balanced with a long finish with plenty of spice and mocha. Exceptional vintage! Winter ended on a relatively warm note in August, resulting in quick growth and even bud burst. A cooler spring slowed growth before warm, dry and sunny early summer conditions accelerated the harvest. Hot weather pre-harvest reduced the crop significantly however the resulting fruit was some of the best seen in recent years. 100% barrel fermented using wild yeast before 27 months of maturation in a selection of French oak barrels. Selected bunches from our cabernet franc were berry sorted before a 10-day cold soak. Berries were transferred to 100% new French oak barrels and allowed to ferment slowly at low temperatures. This wine consists of mainly free-run juice with some press. Wine will continue to develop in the bottle over the next 7 years. Limited production of 120 x 1.5l magnums and 2635 x 750ml bottles. Named after owners Gerard Holden and Migo Mans, this Franschhoek property was originally developed into a wine farm in 1999. Located in the top, southern-most corner of the Franschhoek Valley, in the embrace of its spectacular mountains, the 22 hectares Holden Manz Wine Estate is situated between the Franschhoek River and Stony Brook at 300 meters above sea level. Today it is a lifestyle destination, boasting five-star guest house and spa, restaurant, picnics by the Franschhoek river, with an art collection housed in the town. An exclusive grower of red grapes, the Estate only cultivates its top 16 hectares under vineyards, notably Cabernet Sauvignon, Cabernet Franc, Syrah and Merlot resulting in the production of ultra-premium wines made for the discerning wine connoisseur.